Ihering's hocicudo Brucepattersonius iheringi, copyright Paulo Ricardo de Oliveira Roth. 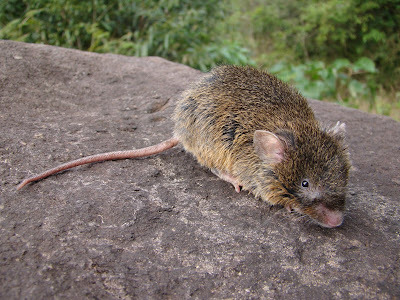 The Scapteromyini are a group of fossorial and semi-aquatic mice found in central South America. The group has been recognised to include the genera Scapteromys, Kunsia and Bibimys but its monophyly has been questioned. [L07] Lareschi, M. 2007. Seasonal occurrence of ectoparasites associated with the water rat Scapteromys aquaticus (Muridae, Sigmodontinae) from Punta Lara, Argentina. In: Morales-Malacara, J. B., V. M. Behan-Pelletier, E. Ueckermann, T. M. Pérez, E. G. Estrada-Venegas & M. Badii (eds) Acarology XI: Proceedings of the International Congress pp. 233–240. Instituto de Biología and Faculdad de Ciencias, Universidad Nacional Autónoma de México, Sociedad Latinoamericana de Acarología: México.